Commemorating the centennial of Cranbrook’s celebrated alumnus, the Cranbrook Art Museum is hosting an exhibition of Harry Bertoia’s jewelry through November 29. The museum exhibition underscores the longstanding history between Knoll's designers and the acclaimed art and design school, where many of Knoll's designers were educated during their formative years, including Harry Bertoia. At once a sculptor, designer, painter, printmaker, musician and jeweler, Bertoia saw to the production of countless objects both purposeful and ornamental during his forty-year career. While internationally recognized for his large-scale metalwork—especially his collection of latticed wire furniture for Knoll, his musical Sonambient and Gong sculptures and his brass and copper screens for corporate interiors—Bertoia’s initial experiments with metal began with jewelry. "Bent, Cast & Forged: The Jewelry of Harry Bertoia" is the first museum exhibition devoted to this underrepresented body of work. 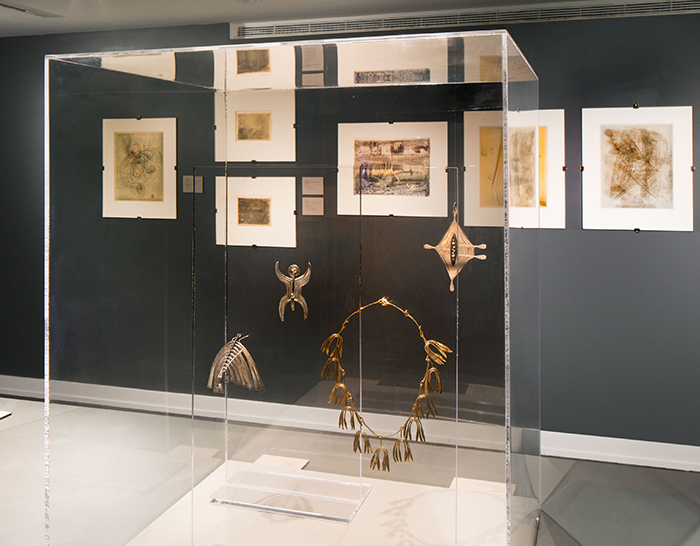 Jewelry and monotypes from "Bent, Cast & Forged: The Jewelry of Harry Bertoia" at the Cranbrook Art Museum, 2015. 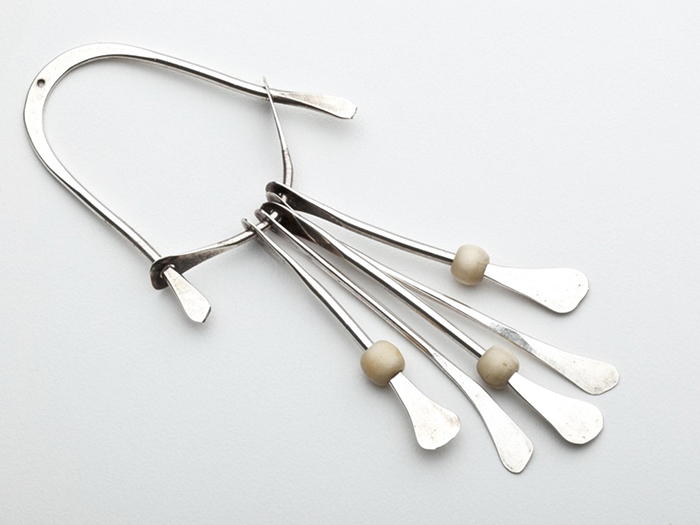 The jewelry pieces demonstrate Bertoia’s early investigations in form, dimension, and structure produced during the first decade of his career. The collection offers an exciting and early perspective on the creative vision that would crystallize in Bertoia's later works. The brooches, bracelets and necklaces showcased are standing evidence of the artist-craftsman’s first forays into biomorphic abstraction and establish him as both a pioneer of the American studio jewelry movement and a master of elevating fashionable adornment to objet d’art. Cranbrook Necklace, 1940 by Harry Bertoia from "Bent, Cast & Forged: The Jewelry of Harry Bertoia" at the Cranbrook Art Museum, 2015. Bertoia began experimenting with jewelry when he was still a child growing up in San Lorenzo, Italy. Captivated by the bracelets and bangles forged by the Gypsies who camped out on the border of his hometown, Bertoia began by emulating what he saw around him. Soon, however, his work was recognized for its display of deft craftsmanship, especially by local brides, who commissioned jewelry and embroidery patterns from the young Bertoia. 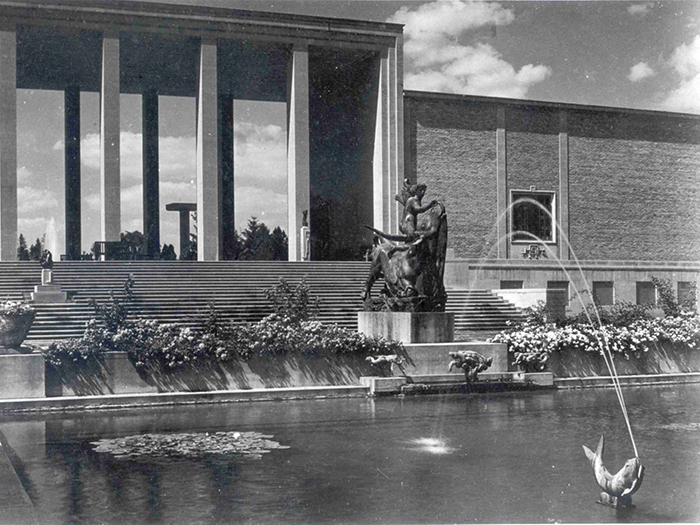 Photograph of The Cranbrook Academy of Art. Photograph by Harvey Croze, 1946. © Cranbrook Archives. At the age of fifteen, Bertoia was approached by his farther and given the choice to stay in a drought-plagued Italy or move to America to stay with his older brother, Oreste. Given his cosmopolitan interests, the burgeoning artist chose to adventure to America, where he took up residence in the motor city of Detroit. After six years in Detroit at the Cass Technical High School, Bertoia enrolled at Cranbrook Academy of Art in 1937. 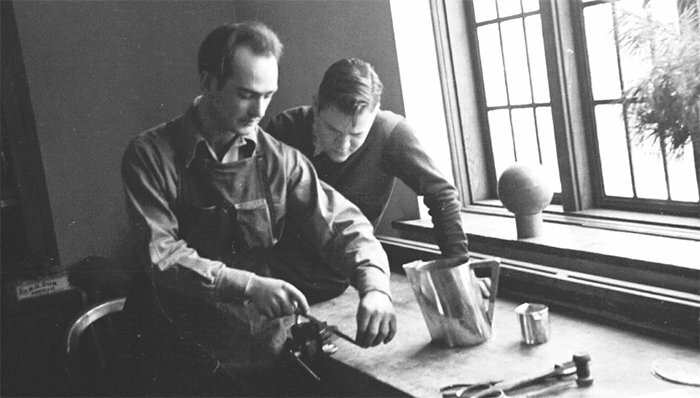 Already leagues ahead of his peers, within a year Bertoia had been appointed head of the metalworking studio by Eliel Saarinen—former President of Cranbrook and father to Bertoia's friend, classmate, and colleague Eero Saarinen. Harry Bertoia teaching metalworking at Cranbrook. Photograph by Richard G. Askew, 1939. © Cranbrook Archives. For Bertoia, jewelry making was a process of creative discovery, fostered through direct, material contact with the pieces he shaped, “I was not the man to do research. My feeling was that had to come from an inward direction. I [had to rely] on my own body.” In this sense, jewelry provided Bertoia an avenue of inquiry to explore conceptual interests on a manageable scale. Demonstrative of the expressive potential of the line, Bertoia's jewelry can be read against later work, including Bertoia's Sonambient sculptures and the collection of wire furniture he designed for Knoll. 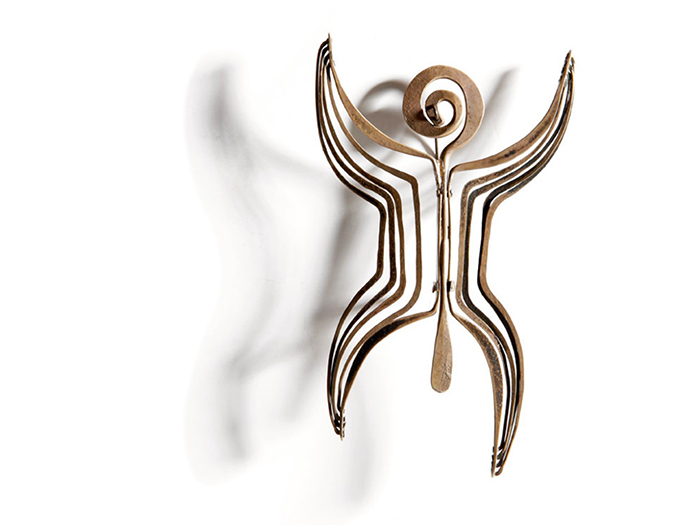 Brooch, 1946 by Harry Bertoia from "Bent, Cast & Forged: The Jewelry of Harry Bertoia" at the Cranbrook Art Museum, 2015. Photography Courtesy of Los Angeles Modern Auctions (LAMA). As Glenn Adamson, the Nanette L. Laitman Director of the Museum of Arts and Design, explains in the talk "Learning from Bertroia" he gave at Knoll's New York Showroom on March 18th, “It was really in jewelry that Bertoia started making his first inroads into what would become his signature aesthetic, through the expression of line, first and foremost, and bringing a line alive through a kind of compositional technique.” Many of the pieces Adamson points to as representative of the common thread through Bertoia’s work are on view in the exhibition, affording those familiar with Bertoia the rare chance to view his ideas in a nascent state. The exhibition "Bent, Cast & Forged: The Jewelry of Harry Bertoia" at the Cranbrook Art Museum, 2015. 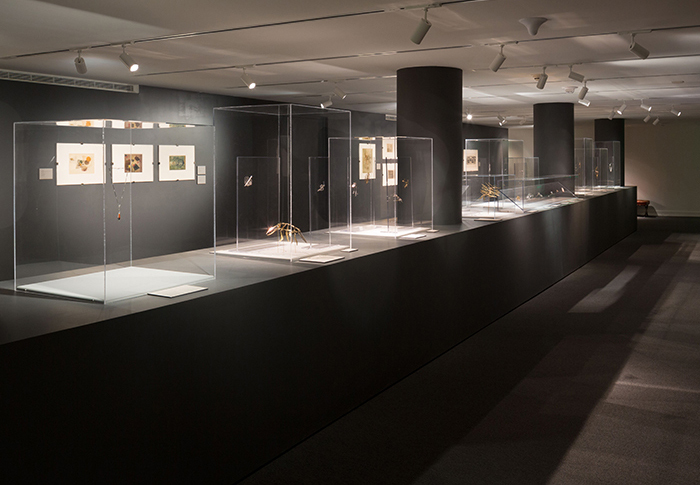 The exhibition "Bent, Cast & Forged: The Jewelry of Harry Bertoia" has been organized by Cranbrook Art Museum and curated by Shelley Selim, the Art Museum’s 2013–2015 Jeanne and Ralph Graham Collections Fellow. The exhibition is sponsored, in part, by the David Klein and Kate Ostrove Exhibition Fund and is accompanied by a full-color catalog sponsored by Wright Auction House and Kim and Al Eiber. Additional thanks go out to Cecilia Bertoia and the Harry Bertoia Foundation, without whom this exhibition would not be possible. For more information, visit the Cranbrook Art Museum’s website. Glenn Adamson's Presentation: "Learning From Bertoia"